At least since Amartya Sen published Poverty and Famines in 1981, we know that food security – viewed globally – is more a question of proper distribution than of a need for ever more productivity. Nevertheless, a “productivist” understanding of food security continues to dominate in science, policy, and practice – gaining steam in the aftermath the 2008 food price crisis – even though more than enough calories for every person on earth are already being produced. In order to better understand and address the “wicked problems” of hunger, malnutrition, and food insecurity, this project takes a food system approach in its analysis of actors, activities, and results of food system activities. In case studies in Kenya and Bolivia, we examine different food value chains (e.g. agro-industrial and agroecological, from production to consumption), the livelihoods of those who depend on them, and the consequences of various food-system related activities. Instead of applying a narrow food security concept, we have adopted an understanding of food sustainability that includes realization of the right to food, environmental sustainability, reduction of poverty and inequality, and resilience of food systems going beyond just producing enough. In a transdisciplinary process, the project seeks to develop a tool to assess the sustainability of food systems – a tool that can also be used by non-scientists who are interested in identifying ways to make food systems more sustainable. An interdisciplinary team of researchers from Switzerland, Kenya, and Bolivia has begun researching various aspects of different food systems in Kenya and Bolivia. Our case studies focus on agro-industrial food systems as well as local, indigenous, and alternative food systems. Five postdoctoral researchers, nine doctoral candidates, and 21 master’s candidates are involved in corresponding “Work Packages” (WPs). WP1 examines the policy context and the right to food from a legal perspective. WP2 looks at institutions and actors from an anthropological perspective. WP3 analyses value chains, livelihoods, and food security. WP4 assesses the environmental sustainability of food systems as well as their social-ecological resilience. Together with our partners and interested organizations in Kenya and Bolivia, we defined indicators for use in assessing each of the five pillars of food sustainability. To assess the environmental performance of food systems, for example, we defined agrobiodiversity and landscape patchiness and connectivity as important indicators, in addition to resource use intensity, generation and handling of waste, emission of greenhouse gases, and more. In a workshop to define ways of assessing the right to food, we identified indicators that describe equality, non-discrimination, and empowerment of vulnerable groups, for example the proportion of land titles held by women, or levels of public investment in agro-pastoral activities. The project is an affiliated project of the 10YFP Sustainable Food Systems Programme of the United Nations Environment Programme. The Programme on Sustainable Consumption and Production Patterns (10YFP) is a gobal multi-stakeholder partnership to accelerate the shift towards more sustainable food systems. A study by CDE researcher Dr. Elisabeth Bürgi Bonanomi sheds light on the new trade agreement EFTA-Indonesia from a sustainability perspective. The parties to the agreement have chosen an innovative, promising approach to palm oil. This approach could be further extended and developed in the context of future trade negotiations (e.g. Mercosur, Malaysia, USA). Co-PI of the r4d Food Sustainability project, Prof. Dr. Chinwe Ifejika Speranza, contributed as a member of the expert group 'Taskforce Rural Africa' to the report “An Africa-Europe Agenda for Rural Transformation”. In December 2018, after evaluating food system sustainability in Kalbeon village near Bolgatanga in Ghana, our local partner Millar Open University together with the village community started to improve processing opportunities for food and Shea. The article of our PhD candidate Horacio Augstburger published in Landscape Online introduces a method that allows to show the benefits that different fam-based agroecosystem can provide to nature and society. The results can help to better decide which land use types within food systems to enhance and which to hinder in order to move towards sustainable food systems. Food Sustainability through Sustainable Trade Relations? “The food systems of the global North and the global South are interdependent and often complementary. Transforming them into sustainable food systems thus requires a joint effort. 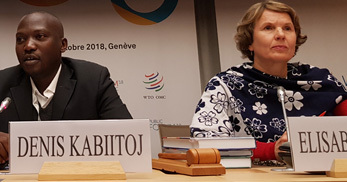 Of particular importance is how trade relations are shaped between partner countries”, said CDE researcher Elisabeth Bürgi Bonanomi at the WTO Public Forum 2018. She emphasized that the current trade regime leaves some policy space to shape agricultural trade in a more sustainable way, i.e. by privileging sustainably produced food (see the “fair food” concept as enshrined in the Swiss Constitution). Resilience is often considered a precondition for sustainable social-ecological systems. But how can this understanding of resilience be applied to food systems? CDE researchers operationalized the concept by subdividing it into three different resilience dimensions: buffer capacity, self-organization and capacity for learning and adaptation. 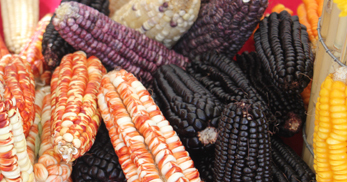 Specific indicators were defined for each dimension and applied to different food systems (agroindustrial, local, and agroecological) in Kenya and Bolivia, including assessment of the interaction and coexistence of food systems. While the contexts in the two countries differ greatly, there are several common trends that appear to be undermining food system resilience in both settings. These trends include low ecological buffer capacity and self-regulation in agroindustrial food systems; strong disparities in income and access to productive resources; competition for water, land, and labor; exclusion from markets; and low human capital and feedback mechanisms in locally based, traditional food systems. The results make it possible to identify leverage points in the food systems that could be used to foster food system transformations linked to goals of sustainability and justice. 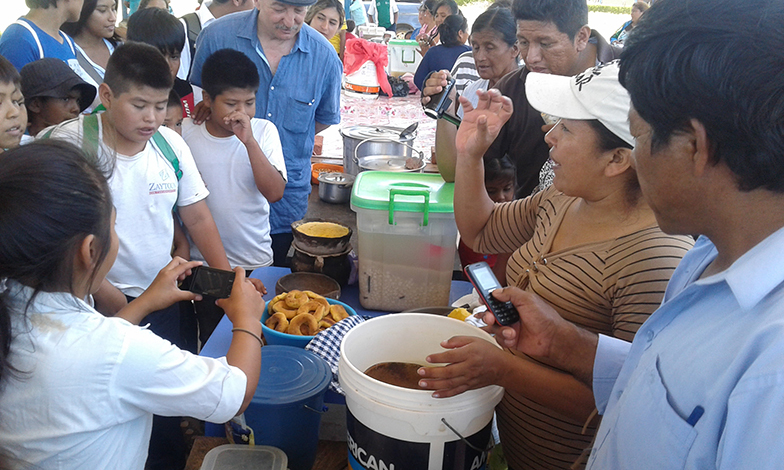 The findings of doctoral researcher Roberto Bascopé of the r4d project Towards Food Sustainability on pesticides in Bolivian soybean production were published in a policy brief in July 2018. They were also presented in a major Bolivian newspaper. The data show that since the legalization of transgenic soya in Bolivia in 2005, imports of related pesticides have quadrupled. Several active ingredients that are prohibited in Bolivia (e.g. methamidophos) are used in soybean production. 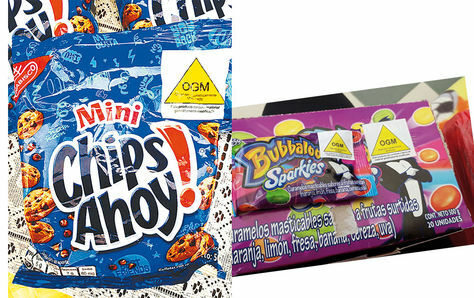 From the 229 active ingredients that are registered, at least 164 are highly toxic and prohibited in other parts of the world. 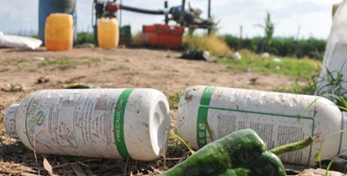 The research is intended to support the Bolivian Ministry of Health, which is currently evaluating all registered pesticides according to their toxicity. Georgina Catacora, r4d researcher in the first phase of the r4d project "Towards Food Sustainability" is also advising the Bolivian Viceministry of Environment and Water on labelling of transgenic food, which is now enforced in Bolivia, as established in the 2015 National Livestock and Agricultural Summit and Law 144. This important achievement contributes to the right to food enshrined in Bolivia's 2009 constitution. Catacora Vargas, Georgina (2016): Agrobiodiversidad en Sistemas Alimentarios Agroindustrial, Indígena y Agroecológico en tres Municipios de Santa Cruz, Bolivia. Tesis para optar el título de Magister en "Agroecología, Cultura y Desarrollo Endógeno Sostenibe en Latinomérica", Agruco, Universidad Mayor de San Simón, Cochabamba. Crespo, Miguel Angel (2016): La situación de la agricultura en Bolivia y crisis de la seguridad y soberanía alimentaria. Documento de trabajo 1 proyecto R4D hacia la sustentabilidad alimentaria en Bolivia y Kenia. Agruco, Universidad Mayor de San Simón, Cochabamba. Gonzales Soto, Danny (2016): Efectos de la Política Púiblica en la Seguridad y Soberanía Alimentaria a partir de la Legislación existente en los Sistemas Alimentarios Agroindustrial, Indígena-Campesino y Agroecológico. Estudio de Caso de los Municipios San Pedro, Cabezas y La Guardia del Departamento de Santa Cruz. Tesis para optar el título de Magister en "Agroecología, Cultura y Desarrollo Endógeno Sostenibe en Latinomérica", Agruco, Universidad Mayor de San Simón, Cochabamba. Hertkorn, Marie-Luise (2016): Implizites und explizites Wissen im Kontext globaler Entwicklung am Beispiel der Interaktionen wissenschaftlicher und bäuerlicher Perspektiven auf "gute Ernährung". Masterarbeit zur Erlangung des akademischen Grades Master of Arts in Geschichte und Philosophie des Wissens am Department für Geistes- Sozial- und Staatswissenschaften der Eidgenössischen Technischen Hochschule Zürich. Hirsig, Sophie, and Märki, Sarah (2016): 'We have the land but not the food': A food system analysis in two communities in the soy production area of Bolivia. Masterarbeit der Philosophisch-naturwissenschaftlichen Fakultät der Universität Bern. Kopp Valdivia, Ciro (2016): Reconocimiento e implementación del Derecho Hmano a la Alimentación adecuada y temas relacionados: Estudio jurídico-político en Bolivia. Documento de trabajo 2 proyecto R4D hacia la sustentabilidad alimentaria en Bolivia y Kenia. Agruco, Universidad Mayor de San Simón, Cochabamba. Pomacosi Andrade, Daniela (2016): Percepciones de los actores sociales sobre: La situación de seguridad alimentaria nutricional, soberanía alimentaria para saber alimentarse en los sistemas alimentarios indígena agroecológico. Tesis de grado para obtener el titulo de Licenciatura en sociología, Universidad Mayor de San Simón, Cochabamba. As defined at the World Food Summit 1996, food security exists "when all people at all times have access to sufficient, safe, nutritious food to maintain a healthy and active life". According to Rastoin and Ghersi (2010:19), food systems can be regarded as “interdependent networks of stakeholders (companies, financial institutions, public and private organizations, and individuals) in a geographical area (region, state, multinational region) that participate directly or indirectly in the creation of flows of goods and services geared towards satisfying the food needs of one or more groups of consumers in the same geographical area or elsewhere”. We extend the definition of stakeholders to explicitly include farmers and consumers. The right of peoples to healthy and culturally appropriate food produced through ecologically sound and sustainable methods, and their right to define their own food and agriculture systems (Nyéléni Declaration 2007). We suggest a definition of food sustainability that is based on five principles: (1) food security; (2) the right to food and other related human rights; (3) the reduction of poverty and inequality; (4) environmental performance; and (5) social-ecological resilience (Figure 1). We further believe that these basic variables for assessing food sustainability must remain consistent with more general principles of sustainable development, such as democratic participation in food system governance, economic viability, and intergenerational equity in both the short- and the long-term. Roberto Bascopé, PhD candidate in the Swiss R4D project “Towards Food Sustainability” led by the University of Bern studied environmental impacts of soybean production in the tropical lowlands of Bolivia. Mit dem Ja an der Urne zum «Bundesbeschluss über die Ernährungssicherheit» vom September 2017 wurden nachhaltige Handelsbeziehungen in die Verfassung geschrieben. Was sind die Konsequenzen dieses Artikels, wenn man ihn ernst nimmt? Mehr dazu mit Kommentaren von Elisabeth Bürgi, CDE.